As you all know I am a big fan of herbal products and love trying and using them. I keep trying different ayurvedic products and then review them. Remember few days back I did Biotique Papaya Exfoliating Face Wash Review. Few months back, on a visit to my saloon, I could see some new skin care stuff from the brand OZONE like Ozone Classic Cleanser, Ozone Moisturizer and many more. When I saw these skin care products, I was quite impressed by its ingredients list with some wonderful herbs like Neem, Aloe Vera etc, so I immediately bought its facial cleanser and skin moisturizer. 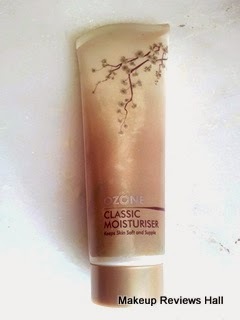 I used both these products regularly for few days and here is my review on the Ozone Classic Moisturizer. Recommended for all skin types.Exposure to pollutants, dirt, UV rays and stress causes extensive damage to skin turning its appearance dark and dull. This Ozone Classic Moisturizer is a unique formulation made from natural organic ingredients. It provides and ideal moisture balance to keep the skin soft and supple. It also helps to maintain its texture. 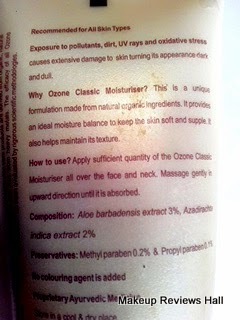 Usage : Apply sufficient quantity of Ozone Classic Moisturizer all over face and neck. Massage gently in upward direction until its absorbed. 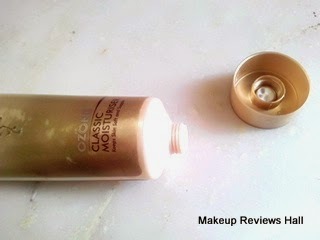 This Ozone moisturizer comes in a nice sturdy golden brown tube packaging. I really like the packaging of this since its convenient and the golden color adds a royal touch to this skin cream tube. The cream is white in color and is quite thick. Take a look at the swatch below. Recommended : Best Moisturizer for Acne Prone Skin. 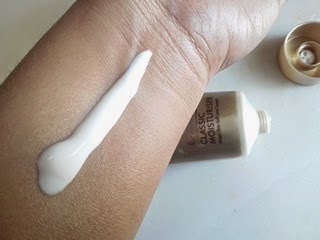 On application the cream feels quite thick and requires little effort to blend, because of its thick texture. The cream feels to be bit heavy and greasy leaving face to be slightly oily and shiny. I used this moisturizer on my dry acne prone skin and this cream immediately brightened up my face adding a shine and glow to it. However, I did not like this shine since I felt to be greasy and heavy on my acne prone sensitive skin. This was not the case with Ozone cleanser, which was really light and worked wonderfully in clearing dirt from skin. The cleanser also contained natural herbs like Neem, Aloe and Lemon thus cleaning skin without doing any harm to it. This was the reason I kept using this Ozone cleanser for long but discontinued the use of the Classic moisturizer just after a week since I found it to be heavy on skin. Using it for few days, I switched back to my all my favorite Clean and Clear Oil Free Moisturizer. However,I liked its texture in winters when I needed some extra moisturizing effect on my extreme dry skin. This Ozone cream worked beautifully on my dry skin in winters without irritating my skin or making it look oily but just perfect. Overall I think Ozone products are quite good, specially its cleanser which is available in lot of variants at various online sites. Regarding the moisturizer I felt its bit heavy for oily and acne prone skin but would work wonderfully on normal and specially dry skin beauties. Comes in convenient travel friendly packaging. Adds shine to dull dry skin. Good for moisturizing dry skin. Quite heavy for acne prone skin. Leaves oily skin look more greasy. Might not work well in summers.